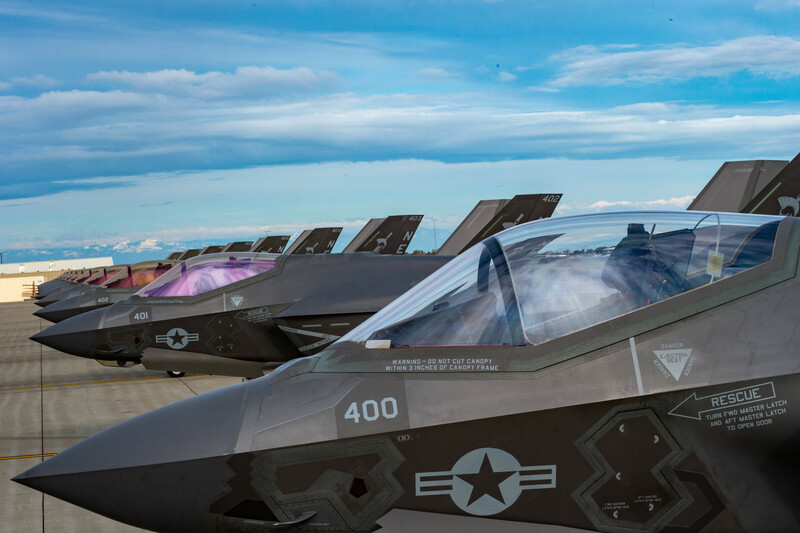 The Navy’s Joint Strike Fighter Wing commodore is focused on getting the first operational F-35C carrier-variant squadron ready for its first deployment and figuring out how to incorporate its fifth-generation capabilities into the rest of a carrier air wing. McCoy said that, like any other squadron at the beginning of its workup phase, VFA-147 is conducting squadron-level training and individual certifications. The squadron is now part of Carrier Air Wing 2, he told USNI News, and so VFA-147 will eventually move into air wing-level training and then strike group-level training. VFA-147 is expected to deploy aboard USS Carl Vinson (CVN-70) in 2021, USNI News has previously reported. The JSF Wing, the Naval Aviation Warfighting Development Center at Naval Air Station Fallon, the Commander of Naval Air Forces and other stakeholders are still working to understand what an integrated air wing looks like, but McCoy said he would ensure that the F-35C’s stealth, sensing, data-sharing and other high-end capabilities would not be lost when the squadron integrates with a carrier air wing and a carrier strike group. 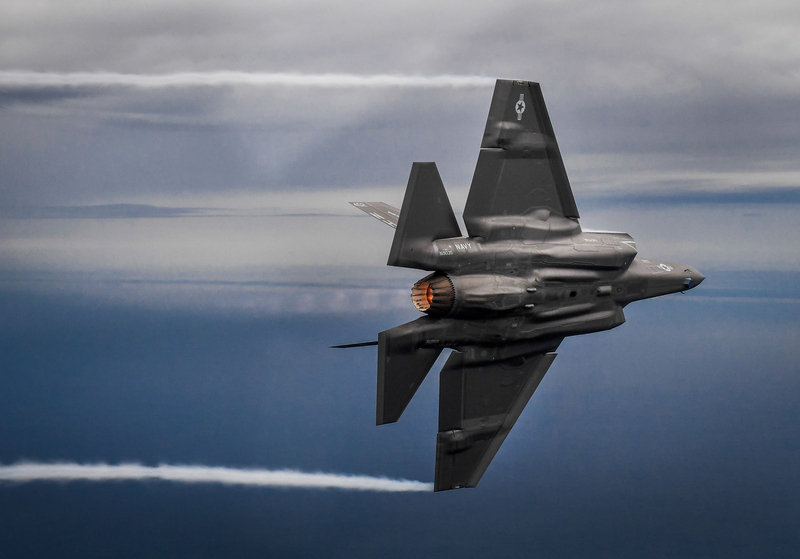 A F-35C Lightning II, attached to Commander, Joint Strike Fighter Wing, the “Argonauts” of Strike Fighter Squadron (VFA) 147, completes a flight overhead Eglin Air Force Base in Fort Walton Beach, Fla., Feb. 1, 2019. US Navy photo. “As the commodore of the F-35C wing, one of the things that I am very clearly focused on and what I want to establish is a culture where we do not necessarily apply a fourth-gen solution to a fifth-gen capability. And so we are doing everything possible right now to find ways to incorporate fifth-gen and integrate with fourth-gen fighters,” McCoy told a small group of reporters on the phone today. McCoy said that most of VFA-147’s pre-deployment workup process would be the same as any other squadron – starting with individual qualifications, then squadron-level training, then the air wing coming together and culminating in advanced training at NAS Fallon ahead of joining the ships in the carrier strike group – though McCoy noted that some of the syllabi for the squadron-level training activities were still being developed now. While the Navy’s VFA-147 moves past the operational testing they did to support the initial operational capability (IOC) declaration this week and into pre-deployment workups, McCoy and the JSF Wing will also be working with the Marines’ VMFA-314 to begin transitioning that Hornet squadron to the F-35C. McCoy said VMFA-314 would follow mostly the same transition process as VFA-147 did: the pilots will train with the fleet replacement squadron in NAS Lemoore in California, and the maintainers will conduct some training at Eglin Air Force Base in Florida and some training in Lemoore. However, instead of McCoy being the one to certify the squadron as “safe for flight” – or ready to operate independently of the fleet replacement squadron – the Marine Aircraft Group 11 commander will be the one to certify them. VMFA-314 will then operate out of Marine Corps Air Station Miramar in California instead of from NAS Lemoore, like all the Navy’s F-35C squadrons will. The commodore added that the Navy has a transition plan for future squadrons, but since those plans were still subject to change he declined to say which squadrons were next set for transition to the F-35C after VMFA-314. Three F-35C Lightning II, attached to Commander, Joint Strike Fighter Wing, the “Argonauts” of Strike Fighter Squadron (VFA) 147, the “Rough Raiders “Strike Fighter Squadron (VFA) 125 and the “Grim Reapers” Strike Fighter Squadron (VFA) 101 complete a flight overhead Eglin Air Force Base in Fort Walton Beach, Fla., Feb. 1, 2019. US Navy photo. 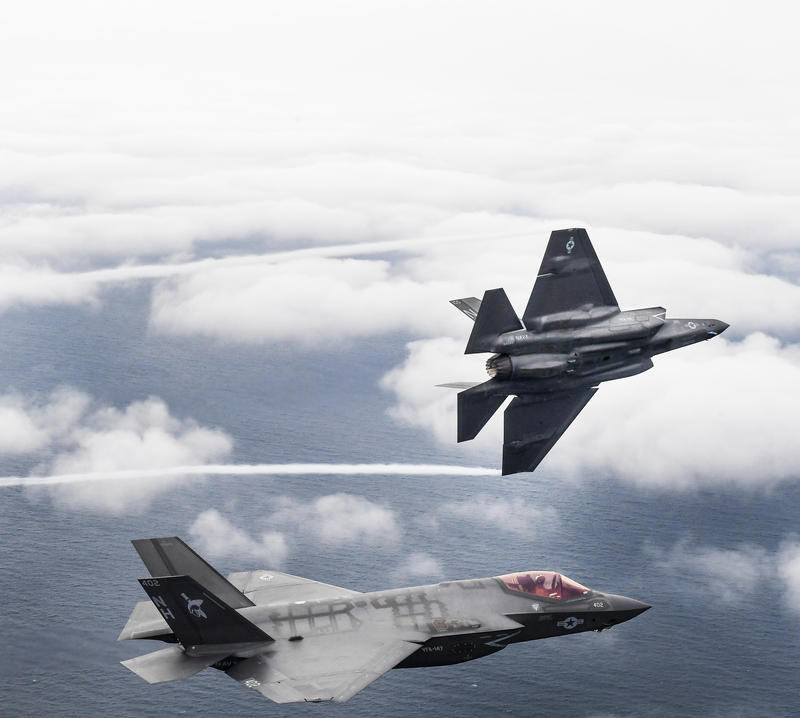 As these two squadrons move forward in their transition and deployment preparation, the Navy and F-35 builder Lockheed Martin will be continuing to mature their understanding of how to sustain the planes ashore and at sea. One of the requirements of the IOC declaration was that the spare parts and logistics chain be mature, and that the Navy have a good understanding of how to work with the Autonomic Logistics Information System (ALIS) and other support systems. McCoy said VFA-147 and the JSF wing had learned a lot about ALIS but still had more lessons to learn for themselves and with Lockheed Martin and the Marine Corps. “We are continuing to look at ways of improving those processes, not only to train our sailors to operate those systems but also to make sure that the sustainment processes are in place for ashore and deployed operations. We’ve learned a great deal ourselves, we’re also capitalizing on what the Marine Corps has learned in their first (F-35B vertical takeoff variant) deployments at sea, and we’re taking those lessons learned and applying them to the United States Navy and then feeding that information back to the Joint Program Office and Lockheed Martin to improve those systems,” McCoy said.